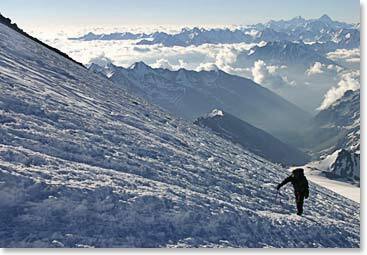 Karina is one of the most remarkable and accomplished young mountaineers in her region, Kabandino Balkaria, Russia, where Mount Elbrus is located. She grew up in the city of Nalchik, near the mountains, and at a young age she found herself going to the hills to ski, climb, and improve her skills as a guide. Karina first worked with Berg Adventures in 2003. In that instant Karina was reminded to who she really is; she left the coffee shop, went back to her apartment, packed her bags, and the next day gave notice at the accounting firm. By the end of the week she was back in the mountains. Karina’s love for the mountains is not only for her back yard — On May 21, 2011 Karina became the first woman from her republic to reach the summit of Mount Everest. 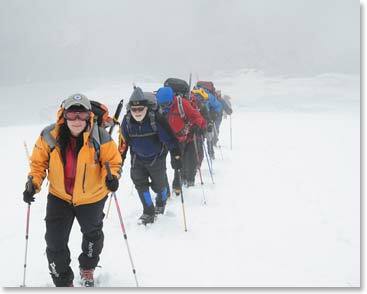 Every year during the winters you will find Karina in the Elbrus region, skiing and ice climbing. Her schedule is also filled communicating with the BAI Canada office while she prepares the visa details and logistics for the upcoming summer season. We are proud that “Karina from the Caucasus” is back where she belongs and that she is available to work for the successful and rewarding Elbrus climbs Berg Adventures clients experience each year. 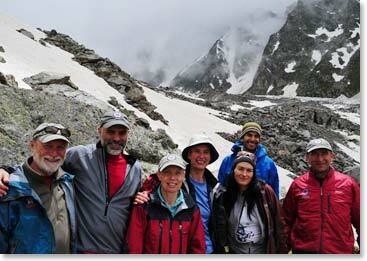 Berg Adventures has a NEW date for the Elbrus 2013 Expedition: June 19 – July 04, 2013 *Summer Solstice in St. Petersburg. 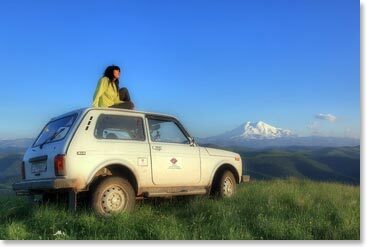 On a sunny summer day not far from Mount Elbrus, Karina sits on her trusty 4-wheel drive, which has been on many BAI adventures in the Caucasus Mountains. 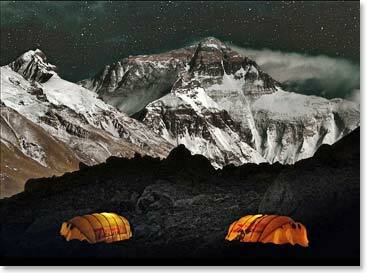 This amazing photo of the North Side of Everest was a part of the presentation that Karina gave in her hometown of Nalchik to celebrate her successful ascent of Everest. Beautiful views of the Caucasus! This entry was posted on Thursday, May 3rd, 2012 at 11:19 pm	and is filed under General.